Apple announced iPad 2 just a few weeks ago.After announcement of iPad 2 Samsung took challenge and refreshed their upcoming tablet Galaxy 10.1 to compete with Apple.iPad 2 is currently available in stores while Galaxy Tab 10.1 will come on June 8. iPad 2 is a great tablet though there are some points where Galaxy Tab 10.1 beats iPad 2.If you are planning to get an Apple iPad 2 then you should reconsider it. 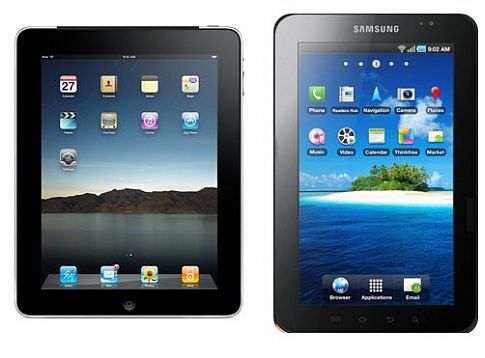 Samsung Galaxy Tab 10.1 is lighter and slimmer than Apple iPad 2.It is only 8.6 mm thick while iPad 2 measures 8.8 mm.Samsung Galaxy Tab 10.1 weights 595 gms while Apple iPad 2 is 601 gms. Samsung Galaxy Tab 10.1comes with 10.1 inch PLS LCD screen with 1280×800 widescreen resolution.Apple iPad 2 has 9.7 inch IPS panel with 1024×768 resolution.Samsung Galaxy Tab’s PLS screen beats IPS panel of iPad 2. 1st generation of iPad did not have any camera.iPad 2 has equipped with two cameras one VGA front camera and one 0.7 MP rear camera capable of recording 720p HD video.Samsung Galaxy Tab 10.1 comers with much better pair of cameras 2MP front camera and 3MP rear camera with Full HD video recording. Samsung Galaxy Tab 10.1 is powered by Android 3.0 Honeycomb OS.It is an tablet optimized operating system.So large screen much better utilized in Android 3.0 Honeycomb OS.Though Android 3.0 Honeycomb currently does not have much apps but situation will change in future. Internet is incomplete without Adobe Flash.We all know that Apple iPad 2 does not support Adobe flash.So it is really a let down.Samsung Galaxy Tab 10.1 fully supports Flash 10.2. Samsung Galaxy Tab comes with MicroSD card slot which supports upto 32GB memory.It is nice to have a MicroSD slot in tablet.We can easily share large data with mobile phones using Micro SD.